By now you may have read several of the reviews and “hands-on” articles about the long-awaited Canon 7D Mark II. The camera’s 65-point autofocus system, combined with its customizable controls and blazingly fast 10 frames per second continuous shooting speed, make it an ideal camera for sports, action, and wildlife. At the same time its Its 20.2 megapixel sensor and high image quality enable it to work great for portraits, landscapes, and more static subjects. Figure 1. Detail of the body and controls of the Canon 7D Mark II. However, what many reviews and hands-on articles and videos about the 7D Mark II seem to miss is the incredible level of customization one can apply to the controls and features of the camera, in order to have it perform exactly how a user needs or desires, to better accommodate a specific shooting situation or a personal shooting style. These are the kinds of features that really differentiate a pro-sumer camera from a mid-level camera, yet are often overlooked in reviews and comparisons. And while the original 7D and the full-frame 5D Mark III both offer a high level of customization, the 7DII takes it to an even higher level, adding options and button-combinations not available on previous models. This can allow the user an even more seamless photography experience, enabling you to concentrate on the scene and the subject while quickly changing to the desired settings or making use of certain features, with just a few button taps or dial turns, and often without your eye leaving the Viewfinder. Figure 2. Fall Foliage at Whipple Hill, Lexington, Mass. with the Canon 7D Mark II. Complete explanation for all of these tips and tricks, and well as clear, comprehensive instruction for the camera, plus descriptions and recommendations for all of the Menu and Custom Function settings, will be found in my camera guide Canon 7D Mark II Experience, which you can learn about and purchase on my Full Stop website. Learn to take control of your 7DII and the images you create with this helpful guide! I have also put together a free, comprehensive Canon 7DII Setup Guide Spreadsheet, which gives recommended settings for all of the Custom Functions and shooting-related Menu items. 1. Make Use of the New AF Area Selection Lever: One of the notable additions to the 7DII is the new AF Area Selection Lever, which surrounds the Multi-Controller thumb-joystick. This lever can be used to quickly change the AF Area Selection mode, such as Single Point, AF Point Expansion, or Zone AF. Do this by first pressing the AF Point Selection Button (at the upper-right on the rear of the camera), then flipping the lever repeatedly as you view the different AF Area configurations in the Viewfinder. Or since you can easily change the AF Area by pressing the AF Point Selection Button then the M-Fn Button, you may wish to customize the new lever to quickly change the ISO setting or the Exposure Compensation amount. In that case, you would turn and hold the lever with your thumb, then turn the top Main Dial to change the assigned setting. Generally you may wish to set it for the ISO option, but when shooting in Manual (M) Mode, for either stills of video, while also making use of Auto ISO, you may wish to set this for the Exposure Compensation option. This configuration will enable you to easily access this new capability of the 7DII, which I will explain below. 2. Take Advantage of Various Autofocus-Related Custom Controls Options: Many of the customization options of the Canon 7D Mark II revolve around the Custom Controls, which can be accessed with the Custom Controls item of the C.Fn3 Menu. While previous Canon dSLR models allowed you to assign various exposure and focusing functions to some of the back buttons, or perhaps to quickly switch between One-Shot and AI Servo with the push of a button, the 7DII will allow you to use various buttons to temporarily change the current AF Mode, Area Mode, and AF Case. For example, if you are taking images of a motionless bird using One Shot AF Mode and Single Point AF Area Selection mode, but then the bird takes flight, you can press and hold a button (that you have pre-assigned) and temporarily make use of AI Servo, with 8-Point AF-Point Expansion, and Case 2 AF Configuration for tracking the subject. Or making use of another option, you can assign a button to temporarily change many of the subject-tracking settings (as you press and hold the button), such as the Tracking sensitivity, the AF point auto-switching setting, and the AI-Servo 2nd image priority. These changes are made, for example, by accessing the AF-ON Button option in the Custom Controls menu, selecting Metering and AF Start, and then pressing the INFO Button to make these further customizations (see Figure 4 – left). Or you can access the DOF Preview Button, select the Switch to registered AF function option, and press the INFO Button to set the desired AF tracking parameters (see Figure 4 – right). While many users may not generally have the need for a sudden switch of autofocusing parameters, it can be incredibly useful for dedicated wildlife or sports photographers who can encounter dramatic changes in a scene or in the subject movement. Figure 4. Two of the different Custom Controls options for assigning various AF settings and operations to one of the camera buttons. Left: Details for the “Metering and AF Start” option of the AF-ON Button. Right: Details of the “Switch to registered AF function” option of the DOF Preview Button. There is also the option to use a button to immediately switch to a different set of shooting settings in addition to the AF settings, including the shutter speed, aperture, ISO, white balance, metering mode, exposure compensation. This is shown in Figure 5, where the AF-ON Button is set to the Register/recall shooting function option, and then the INFO Button is pressed to set the specific parameters. As you can see, you can select which shooting settings will be included by adding the check-mark, and then you can set the desired setting or amount for each item, such as 3200 for the ISO Speed. Then when shooting, you can press and hold the AF-ON Button to immediately recall all those settings. Figure 5. Assigning the AF-ON Button to the Register/recall shooting function option, then pressing the INFO Button to set the desired parameters. 3. Make Use of the Q Button and INFO Button to Quickly Change Shooting Settings: These buttons will also allow you to quickly access and change various camera settings and functions, rather than having to dig into the menus to find what you are looking for. The Q Button will access the Quick Control Screen (Figure 6 – left), which you can navigate using the Multi-Controller, and then either change the settings directly on the screen by turning one of the dials, or press the SET Button to view all the options and to select your desired setting. One handy new addition to this screen is the memory card selection icons. While you can press the SET Button here (or use the menus) to specify how the two cards are used (for example overflow, JPEG/RAW, or backup), you can highlight these icons and then turn one of the dials to directly and immediately choose which card is the the current primary card being used for recording and playback. This is especially handy during playback when you are looking for a specific image on one of the inserted memory cards, but then realize it is on the other inserted card, yet the 7DII will only playback the images from one card at a time. Figure 6. Left: The Quick Control Screen, accessed with the Q Button, for quickly changing settings. Right: If you press the INFO Button and access the Shooting Function screen, and then press any of the top camera buttons, you can quickly view and change those settings using the rear LCD monitor. If you first press the INFO Button a couple times and and access the Shooting Function Settings screen (which resembles the Q screen of Figure 6 – left), you can press any of the top camera buttons and quickly view and change those settings on the rear LCD Monitor. This will allow you to more easily view the settings than the smaller top screen, while also allowing you to see all the available options. For example, Figure 6 – right shows the INFO screen for the AF/Drive button, which allows you to see all the available options in both word and icon format, and also indicates which dial to turn to change which setting (the top Main Dial indicated by the half-circle, or the rear Quick Control Dial). 4. Take Advantage of the Creative Photo, Rate, and M-Fn Buttons: The Creative Photo Button, located at the upper-left of the rear of the camera, will allow you to quickly access the Picture Style settings, Multiple Exposure, and HDR Shooting, rather than having to go into the menus to find those features. The Rate Button, also on the left side of the rear of the camera, will enable you to quickly rate an image during image playback. You can choose from one to five stars, or if you find that you typically only use 1 star, 3 star, and 5 star ratings, a menu item will allow you to limit the selection to just those options (Setup 3 > Rate Button Function, then press Q to limit the ratings). So, for example, you would only need to press the button 3 times to cycle from 1 star, to 3 star, to 5 star, without wasting those precious seconds and button pushes for the 2 star and 4 star ratings you never use! If you prefer the Rate Button to act as the Protect Button, you can use the Rate Button Function menu item to instead assign it to that function. Figure 7. Customize the M-Fn Button to shoot simultaneous RAW plus JPEG, or to cycle through the top button settings. The M-Fn (Multi-Function) Button, located on the top of the camera near the Shutter Button, is used in conjunction with first pressing the AF Point Selection Button in order to select the desired AF Area Selection Mode. However, when simply pressed by itself, if is used for Flash Exposure Lock. If you don’t need it for that function, you can perhaps change it to one of the RAW+JPEG settings, so that you can temporarily or permanently switch to capturing images in both file formats. Or a handy option is to set it for the Cycle option, which allows you to cycle through the various top button settings such as White Balance, ISO, and Drive Mode, as you view the settings on the top LCD screen (see Figure 7). This can perhaps be quicker and easier than slowing down to first look and see which tiny button is used to access which setting. Press it one time and the WB/ Metering Mode options will be active on the top screen and available for you to change, as if you pressed the WB/Meter Button. Press it again and the Drive Mode/ AF Modes will be active, etc. Figure 8. Detail of the top controls of the Canon 7D Mark II. 5. Use Manual (M) Shooting Mode with Auto ISO plus Exposure Compensation: The Canon 7D Mark II allows you to perform a function which, if I recall correctly, cannot be done with the original 7D, 5DIII, or 70D – which is to simultaneously use M shooting mode (for either still photography or movie shooting) along with Auto ISO, while also making use of Exposure Compensation. This is a very powerful option for those shooting in Manual. Using Auto ISO with Manual Mode allows you to set your desired shutter speed and aperture settings, and the camera will then select the appropriate ISO setting in order to obtain the proper exposure. If you suddenly move to a brighter or darker settings, you can retain the same exposure settings, and the camera will automatically adjust the ISO setting to maintain the proper exposure. This allows you to concentrate on your subject and composition without having to worry about or adjust the exposure settings. It can also be incredibly useful during movie shooting in order to maintain a consistent exposure even if the scene or lighting levels change. However, if you are unhappy with the exposure results that the camera has determined, the 7DII now allows you to also apply Exposure Compensation in this situation, in order to make the subsequent images darker or lighter, to better suit your intentions or desires. Since the dials are being used for the shutter speed and aperture settings when working in M shooting mode, they cannot be used for Exposure Compensation (EC), so you will need to access the Quick Control Screen to change the EC setting. However, as mentioned above, you can assign the AF Area Selection Lever to the Exposure Compensation option, and then you will simply need to hold the lever and turn the top Main Dial to change the EC amount, while viewing the setting in the Viewfinder or top Control Panel. Figure 9. Making use of Manual (M) Mode with Auto ISO and Exposure Compensation. These tips will be continued in Part 2, coming soon! Don’t forget about my free, comprehensive Canon 7D Mark II Setup Guide Spreadsheet, which provides recommended settings for all of the Custom Functions and shooting-related Menu items of the 7DII! To learn more about using and taking control of your Canon 7D Mark II, please have a look at Canon 7D Mark II Experience, which you can learn about and purchase on my Full Stop website here. It not only covers the buttons, controls, menus, features, and functions of the camera, but more importantly explains when, why, and how to make use of them in your photography! And if you have enjoyed this post but have not yet purchased your 7DII, please use my affiliate links to make your purchase. Your price will be the same, and they will give me a small referral bonus – thanks! You can use the links below to go to Amazon, or the links at the side of the page for Amazon UK or Amazon Canada, or for B and H Photo. As you likely discovered as soon as you starting exploring the controls, features, menus, and Custom Settings of your 36.3 MP, full-frame Nikon D810, it is a powerful, highly customizable, and versatile camera. There are numerous Menu options and Custom Settings that you can make use of in order to fine-tune the camera to perfectly fit your needs, shooting style, and scene or situation. The autofocus system and exposure metering system can be adjusted according to your preferences, the camera controls can be customized and assigned to a variety of functions, the displays, White Balance, and Auto ISO can be tweaked according to your needs. Plus several new features have been added to the D810 compared to its predecessor the D800/D800E, and all of them enhance the shooting experience. Many of them will be explained throughout this article. I’ve spent some dedicated time with the D810 as I’ve researched and written my e-book user’s guide to the camera called Nikon D810 Experience, and below are the some of the top “tips and tricks” I’ve discovered for setting up and photographing with this powerful dSLR. And be sure to read to the end of the article to learn about my free, detailed, and comprehensive Nikon D810 Setup Guide spreadsheet, which covers recommended Menu settings, Custom Settings, and exposure settings for various types of shooting situations! 1. Take Control of the D810 Autofocus System: Before getting into some of the tips regarding features and functions specific to the D810, one first needs to take control of the basic functions of the camera, including the autofocus system and exposure metering settings. The D810 boasts the 51 point autofocus system of its predecessor the D800, with 15 centrally-located cross-type points. The large number of focus points and their positions in the Viewfinder will allow you to focus exactly where you wish – with minimal recomposing (when working in Single-Servo AF-S mode), plus will better enable you to track moving subjects throughout the frame when working in Continuous-Servo (AF-C) autofocus mode. The different autofocus modes (AF-S, AF-C) and the various autofocus area modes (Single Point, Dynamic Area, etc. plus the new Group Area AF) may be intimidating at first, but once they are understood, it is easy to determine which combinations fit your shooting needs. I wrote an entire post introducing the use of the Nikon autofocus system, its AF and AF-Area modes, and its controls. (Despite the larger number of AF points in the D810, the system works nearly the same as explained in the article.) If you have not used one of the more current Nikon dSLR models such as the D800, D7100/D7000, or D610/D600, you may at first be confused by the autofocus controls with the AF switch / button near the base of the lens (used in conjunction with the Command Dials), but you should quickly find that it is a quick and convenient way to change the AF modes and AF area modes. Simulated view of the Nikon D810 Viewfinder, with all 51 AF points shown for reference. In addition, the D810 offers several Custom Settings to customize various aspect of the autofocus system, namely the ones in the a: Autofocus category. You can use these to tell the camera if achieving exact focus takes priority over maintaining the fastest continuous frame rate, how long the AF system continues to track a specific subject (distance) even if the subject momentarily moves away from the active AF point, and if the active AF point is illuminated in the Viewfinder. Using Custom Setting a5: Focus Point Illumination, you can now choose to display the cluster of all of the AF Points of a Dynamic-Area (such as 9-Point or 21-Point), rather than just the active middle point of the cluster. And you can even limit the number of selectable AF points to 11 if that helps you to more quickly or easily select your desired AF point. Most of these options are explained in my previous Nikon AF system post mentioned above. The D810 also offers the ability to remember a specific AF Point so that the camera will automatically jump to the last point used when the camera is held in a specific orientation. For example, if you last used an upper-right AF Point when holding the camera in the grip-up position, then returned to shooting with the camera in landscape orientation, when you next hold the camera in the grip-up position, the camera will automatically jump back to that upper-right point. This is done through Custom Setting a9: Store by Orientation. You can register different points for each of the camera orientations. Similarly, you can assign the center Multi Selector Button to be used to jump to a Preset Focus Point of your choice, when the button is pressed during shooting. 2. Make Use of the new Group Area AF Autofocus Mode: The D810 borrows a new focus mode from the flagship Nikon D4s – Group Area AF, which makes use of a group of five AF Points arranged in a cross-shaped pattern. Instead of selecting a primary point with the surrounding points acting as “helper” points as with the Dynamic-Area AF modes, you will actually be selecting the group of five points which will all be used to attempt to focus on the subject. The Viewfinder will display the four outer points of the Group Area AF group of points, but not display the central point – perhaps so that you can better view the subject. Or you can use Using Custom Setting a5: Focus Point Illumination to display four surrounding dots rather than larger squares. Nikon D810 – Group Area AF – Simulated view of the D810 Viewfinder, showing what you will see in the viewfinder when making use of Group Area AF, with the cross-shaped pattern of the four outer AF Points of the Group visible. Background image shown at 65% opacity to better view Focus Points. Keep in mind that with the other somewhat similar Dynamic-Area AF modes, you choose a primary point and attempt to keep the subject located at that point, and the surrounding points act as “helper” points if the subject happens to move away from the primary point. But with Group Area AF you select the entire group of AF Points, and they all work equally to focus on the subject. This mode can be used similar to Single Point AF but when it might be challenging to locate the subject under an individual point, which might cause you to accidentally focus on the background. When working in AF-S Focus Mode and using Group Area AF, the selected AF Points will give priority to faces if they are present, otherwise they will focus on the closest subject. 3. Take Advantage of the new [i] Button, and the “Hidden” Features it will Access: The D810 adds the [i] Button (on the rear of the camera) which gives you immediate access to the Information Display screen, where many shooting settings and functions can be viewed and changed. You can press this button to turn on the Information Display on the Monitor and immediately access these settings with the use of the Multi Selector and OK Button or the center touch-pad button. Press the [i] Button a second time or the Info button to “de-activate” the settings and simply view the camera settings on the Information Display Screen. Or, after the Info Button is pushed to display the camera settings of the Information Display screen on the rear Monitor, this [i] Button is pressed to “activate” the screen to enable changing the settings. In addition to the readily accessible camera buttons on the body of the D810, this [i] Button and Information Display screen can be a quick and easy way to change many of the camera settings without having to dig into the menus, such as Active D-Lighting, High ISO Noise Reduction, Color Space (sRGB vs Adobe RGB), and Long Exposure Noise Reduction. Plus you can use this screen to quickly access and customize the Preview (Pv) Button, AE-L / AF-L Button, and Fn Button Assignments. The Information Display of the D810, accessed with the Info Button or i Button, and “activated” with the i Button. The [i] Button can also be used during Live View shooting, Movie shooting, and Image Playback – to quickly access a number of applicable functions, some of them are sort-of hidden unless accessed this way, such as the LCD Monitor White Balance adjustment, and the Highlight Display for showing “zebra stripes” at potentially over-exposed areas of the scene during Movie Live View. During Live View shooting, the [i] Button can be pressed to access settings including Image Area, Active-D Lighting, the new Electronic Front-Curtain Shutter, Monitor Brightness, Photo Live View Display White Balance (explained just below), or Split-Screen Display Zoom to compare two magnified areas of the scene in order to confirm that the image is level (as will be described in Tip 5 below). The Photo Live View Display White Balance feature allows you to set the white balance of the Live View screen differently than the current white balance of the scene. This may sound odd, until you realize it can come in handy when setting up a shot that will actually be taken with different lighting, such as a Speedlight or studio strobes. So using this feature you can set the LCD Monitor WB to better match how the final image will appear. During Movie shooting, the [i] Button will access Image Area, Frame Size and Frame Rate, Movie Quality, Microphone Sensitivity and Frequency Response, Wind Noise Reduction, Destination to select the active memory card, Monitor Brightness, Highlight Display to view “zebra-stripes” at overexposed areas of the scene, and Headphone Volume. Plus during video playback, the [i] Button is also used to display movie edit options. When reviewing images during Image Playback, the [i] Button will access the Retouch Menu, which will allow you to apply various image edits such as Color Balance, Filter Effects, and Distortion Control. Be sure to take advantage of the [i] Button in these various mode, rather than digging into the menus, to easily access some of the most often used features as well as a couple of the “hidden” features. I have written a separate post about the “Hidden” Features of the D810 so that you can explore them further. Nikon D810 Retouch Menu – Using the Cross Screen item of the Retouch Menu to create a cheesy starburst pattern! 4. Improve Exposures with the new Highlight Weighted Metering Mode: The D810 adds a brand new metering mode, Highlight Weighted Metering. This mode is designed for certain challenging lighting situations, in order to help retain detail in bright areas and avoid the overexposure of highlights. It does this by measuring the brightness in a scene then determining the best exposure level which will prevent the highlights from being overexposed (“blown-out”). It should prove to be a useful metering mode for those who shoot theater and live music performances where the lighting can suddenly and dramatically change, or even remain consistent but be prone to include bright “hot-spots” of illumination on a subject. It can also be used in other scenes that include a well lit subject against a dark background, particularly one that is moving and thus prevents the use of Spot Metering. And it can be used at a wedding reception where the bride may be under a spot light, and you wish to properly expose the scene and the subjects yet retain all the subtle details in the highlights of the wedding dress. Also take advantage of the quieter Quiet Shutter Release (Q) and Quiet Continuous Shutter Release (Qc) release modes when in theater, performance, or wedding situations, in order to reduce shutter noise as you take your shots. With Highlight Weighted Metering Mode when the camera’s exposure settings are biased to avoid the overexposure of highlights, they may result in some of the other areas of the scene, such as the midtones, being slightly underexposed. However, with the excellent sensor performance of the D810, even at higher ISO settings, you should be able to easily adjust the midtone and shadow areas of an image without increasing the appearance of digital noise. Shooting in the RAW file format rather than JPEG format will allow you more post-processing flexibility for these adjustments than will images in the JPEG format. Note that when using a lens other than a Nikon G, E, or D lens (typical current lenses) with the D810 set for Highlight-Weighted Metering, the camera will actually use Center-Weighted Metering. The Highlight-Weighted Metering Mode of the D810 is designed for theater / performance scenes such as this, where a brightly lit subject is against a dark background, and is prone to overexposed hot-spots due to theater lighting. -the Exposure Delay Mode (Custom Setting d4) to delay the shutter release for a couple seconds after you press the Shutter Button. -and of course a tripod and a remote shutter release. Landscape and architectural photographers can also make use of the new Split Screen Display Zoom during Live View, where you can simultaneously zoom in on two different areas of the frame (on the same horizontal plane) to help determine if they are level. Press the i Button when in Live View to access this feature, then navigate to the desired area of the scene, and zoom in or out. Press the Protect (key icon) Button to select the other half of the screen and navigate to the desired area of that side of the scene. Since this feature is used to determine if the framing is level, both sides of the screen will move up and down simultaneously when you navigate either side. Press the i Button again to exit the Split-Screen. The Split-Screen Display Zoom of the D810, accessible during Live View shooting, to check if the framing of the scene is level. You can also make use of the Electronic Level on the rear LCD Monitor, the Live View Electronic Level, or the Virtual Viewfinder Horizon level which is seen in the Viewfinder. Assign the Fn or Pv Button to display the Virtual Viewfinder Horizon level, via Custom Setting f4 or f5. And landscape photographers will also want to take advantage of the new, lower 64 ISO setting. This is a “native” ISO setting, not an artificial one created by processing. Landscape photographers (and videographers) often need to use dark ND filters in order to block some light so that they can take advantage of wide apertures settings, such as f/2.8. Or they are used so that you can obtain slower shutter speeds when desired, such as when you wish to blur the motion of water. By enabling you to lower the ISO below 100, it will reduce the need for an ND filter in some situations. If you have found this helpful and plan to purchase a Nikon D810 or some lenses or accessories for it, please consider using my affiliate links for Amazon or for B and H, found at the left side of this page. Your price will be the same, but they will give me a small referral fee – thanks! And please feel free to spread the word if this blog has been helpful. DSLR camera users are often curious about “hidden features” that their camera may have, though typically there really aren’t many, as long as one carefully goes through all of the Menu and Custom Settings items, and reads through the manual. However, with so many options and functions, there are a few items that truly are a bit hidden away on the Nikon D810. It’s not that the D810 manual doesn’t mention them, or that they can’t be found with careful investigation of the camera, but you may need to have them called to your attention to learn how to locate them and how to take advantage of them. Several of these features are accessed with the new i Button when working in the appropriate mode, and others are accessible in the menus but may require an understanding of the options, or several steps of sub-menu navigation to locate them. Simulated diagram of the Nikon D810 Viewfinder, showing the locations of all of the AF Points, with the active Dynamic Area 21 Point squares shown in red. (Image shown lighter to better see Viewfinder elements.) Please note that all AF Points will not be visible in the Viewfinder when shooting, only the active AF Point or Group. Pressing the i Button when shooting will allow you to access and change several settings using the Information Display on the rear LCD Monitor, such as Active D-Lighting, Color Space (sRGB vs. Adobe RGB), High ISO Noise Reduction, and Long Exposure Noise Reduction. It will also allow you to assign the function of various camera buttons including the Pv, Fn, BKT, and AE-L/AF-L Buttons. However, when working in Live View, Movie Live View, image playback, and movie playback, the i Button will access a contextual menu for that mode, and in some situations it is the only way to access and change certain of these “hidden” features. For example, when working in Live View, you can press the i Button to adjust the Monitor Brightness. This is a different adjustment from the Monitor Brightness adjustment of the Setup Menu which affects the brightness of the screen for menus and image playback. The Live View Monitor Brightness adjustment, obviously, adjusts the screen brightness for Live View, but will not affect the exposure of the actual image. The Live View i Button menu will also allow you to access the Photo Live View Display White Balance feature. This feature allows you to set the white balance of the Live View screen separately than the actual white balance that the image will be captured this. While this may sound odd, it can come in handy when setting up a shot that will actually be taken with different lighting, such as a Speedlight or studio strobes. So using this feature you can set the LCD Monitor WB to better match how the final image will appear. The i Button is also the only way to access the new Split Screen Display Zoom during Live View, where you can simultaneously zoom in on two different areas of the frame (on the same horizontal plane) to help determine if they are level. This can come in handy for landscape and architectural photographers. Press the i Button when in Live View to access this feature, then navigate to the desired area of the scene, and zoom in or out. Press the Protect (key icon) Button to select the other half of the screen and navigate to the desired area of that side of the scene. Since this feature is used to determine if the framing is level, both sides of the screen will move up and down simultaneously when you navigate on either side of the split-screen. Press the i Button again to exit the Split-Screen. Although the Electronic First-Curtain Shutter is accessible with Custom Setting d5, and thus isn’t hidden, I will mention it here because it can also be accessed with the i Button during Live View. This is a feature eliminates the mechanical movement of the front curtain and can help reduce camera shake, which can lead the slight blur and reduced sharpness in images. With the high resolution 36.3 megapixel sensor of the D810, these slight movements can become apparent in images. What you need to know is that this feature must be used in conjunction with Mirror Up (Mup) Release Mode. Simulated diagram of the Nikon D810 Viewfinder, showing the locations of all of the AF Points, with the active Single Point square shown in red. Please note that all AF Points will not be visible in the Viewfinder when shooting, only the active AF Point or Group. Just as with Live View, some “hidden” features can be accessed with the i Button when working in Movie Live View. The new “zebra stripes” feature is accessed with the Highlight Display item of the i Button menu. This will display lines on the screen at potentially over-exposed areas of the scene, thus helping you to adjust to the proper exposure. You can also press the i Button to adjust the Monitor Brightness and the Headphone Volume. A few other “hidden” features of the Nikon D810 can only be accessed by customizing one of the camera buttons to assign it to that function. For example, you can make use of the Viewfinder Virtual Horizon, which is a camera level that you can display in the Viewfinder. It will show an electronic level along the bottom of the screen as well as one on the right side, so that you can see both pitch and roll of the camera body. In order to use this feature, you need to assign either the Fn Button or the Pv Button to the Viewfinder Virtual Horizon option. You can also assign either of these buttons to the 1 Step Shutter Speed / Aperture setting, which will allow you to quickly change the shutter speed or the aperture setting in 1 EV full stops rather than the typical 1/3 EV adjustments that are made when you turn the Command Dials. The Nikon D810 offers the Power Aperture feature, where you can smoothly open or close the aperture during movie shooting. While the previous D800/D800E only allowed use of this when recording to an external device, the D810 allows you to use Power Aperture when recording to a memory card. If you wish to use Power Aperture, you will need to assign Custom Settings g1 and g2 to Power aperture (open) and Power aperture (closed). 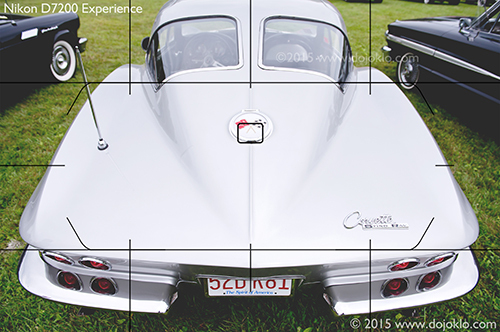 1963 Chevrolet Corvette Sting Ray, Split Window Fastback – 2014 Annual Antique Auto Show – Codman Estate, Lincoln, Mass. Use the Viewfinder grid or Viewfinder Virtual Horizon to keep your framing straight and level. Here I lined up the grid with the roof crease to both center the car and to keep the framing level. Another somewhat “hidden” feature is a method of changing which memory card and folder is being accessed during image playback. The D810 has both a CF and SD memory card slot, though you can only view images on one of them at a time. If you wish to switch over and view the images on the other card during image playback, simply press the Zoom-out Button repeatedly, and you will access the Playback slot and folder screen (rather than the calendar view screen of other Nikon models). Finally, like all the current Nikon models, the D810 offers a powerful Auto ISO option, which will change the ISO setting if necessary in order to obtain a proper exposure. You can set the parameters of Auto ISO, including the Maximum Sensitivity and Minimum Shutter Speed that the camera will use for Auto ISO. One powerful option is that if you choose the Minimum Shutter Speed to be Auto, the camera will select a shutter speed based on the focal length of the lens. For example, a longer lens requires a faster shutter speed to avoid blur from camera movement. But, if you are unhappy with the choice that the camera is making, you can continue to press right from the Minimum Shutter Speed > Auto setting, and you can fine-tune this setting so that the camera selects a faster or slower Auto shutter speed. Please note that the guide will also apply to the D800 and D800E, but new D810 menu items and features will obviously not be on the D800, and the names/ terms of some of the items has changed slightly. First, be sure to set the print area, to avoid all the blank pages. Do this by manually selecting all the cells with data in them (drag the cursor from cell A1 to G168 and they will all appear blue.) Then access the menu for File > Print Area > Set Print Area. Please know that I am in no way an experienced expert in all of the different photography categories I have included, so take the advice of dedicated Bird or Concert photographers, for example, above mine if it differs! And for further information, explanations, justifications, and caveats for the settings I specify, please have a look at my clear and comprehensive guide Nikon D810 Experience. Nikon D810 – 1965 Ford Mustang GT – 2014 Annual Antique Auto Show – Codman Estate, Lincoln, Mass. If you have purchased my Nikon D810 Experience e-book guide, be sure to sign up on the updates page, so that I can inform you of any updates made to the guide or to this spreadsheet, and well be able to provide you with a free updated guide, should there be any major updates or corrections. Nikon D810, shown with 50mm f/1.4 AI-S lens. Camera courtesy of LensProToGo. Lens courtesy of Newtonville Camera. If you have found this blog helpful and plan to purchase a Nikon D810 or some lenses or accessories for it, please consider using my affiliate links for Amazon or for B and H, found at the left side of this page. Your price will be the same, but they will give me a small referral fee – thanks! And please feel free to spread the word if this blog has been helpful. Nikon D3300 Experience is an e-book user’s guide that goes beyond the D3300 manual to help you learn when and why to use the various features, controls, and menu settings of this versatile camera. This guide is written for those who wish to get more out of their camera, go beyond Auto, Program, and Scene modes in order to shoot competently in Aperture-Priority (A), Shutter-Priority (S), and Manual (M) Shooting Modes. Learn to use your D3300, quickly and competently, to create the types of images you want to capture. The Nikon D3300 is an excellent image making tool, and this guide explains how to begin to use it to its full capability. It will help you begin to take control of your camera, the image taking process, and the photos you create. To get you started, Nikon D3300 Experience guides you through all the Playback, Shooting, Setup, Retouch, and Movie Menus of the D3300 to help you best set up the camera and its controls for your specific shooting needs. The guide covers basic dSLR camera functions and exposure concepts for those new to digital SLR photography, and explains more advanced camera controls and operation, such as taking full advantage of the 11-Point Autofocus System and its AF Modes and AF Area Modes for sharp focus of still and moving subjects. It explains how and when to use the various metering modes and exposure compensation for correct exposure of every image, how to take advantage of other features of the D3300 such as the in-camera Special Effects Shooting Modes, and introduces the HD video capabilities. Setting Up Your D3300 – All of the D3300 Playback, Shooting, Setup, Retouch, and Movie Menus, with explanations and recommended settings for practical, everyday use. Set up your dSLR to work best for the way you photograph. Auto Focusing Modes and Area Modes and Release (Drive) Modes – The D3300 autofocus system is a important tool, and taking control of it will enable you to successfully capture more sharp images in still and action situations. Learn the AF Modes and AF Area Modes, how they differ, how and when to take advantage of them to capture both still and moving subjects. Plus how and when to use focus lock and back-button focusing. Exposure Metering Modes of the Nikon D3300 – How they differ, how and when to use them for correct exposures in every situation, and how to customize them for your needs. Also how to make use of exposure lock and back-button focusing. Histograms, Exposure Compensation, and White Balance – Understanding and using these features for adjusting to the proper exposure in challenging lighting situations, and setting custom white balance. Photography Accessories – The most useful accessories for day-to-day and travel photography including accessories specific to the D3300.